Every year avid trekkers walk the Kokoda Track, to feel some of what our diggers endured, to have some understanding of our history, to feel their pain, to see why they gave their all for us. But rarely, there is something found along the way that brings an entire family and strangers together. Ronald Goodwin was like every other soldier in the World War 2 conflicts, he carried a gun, he carried his dry rations, and he carried the hopes and dreams of surviving this bloody conflict. Ronald carried like every other soldier his identity disks, dog tags. Ronald was one of the lucky ones to survive the war however he lost many mates, four years of civilian life and his dog tags. Ronald passed away at his home in Millswood, SA in 1985. 28 years on from Ronald’s death, he was again found. Found in the jungles of Papua New Guinea. John Parnaby a Kokoda Trek guide for Escape Trekking Adventures, was guiding a trek over the now infamous Black cat track. Whilst taking a lunch break near Mabo around 30kms of trekking from Salamaua on the North Coast of Papua New Guinea, where Australian forces fought the Japanese in 1942. A local showed one of the trekkers a dog tag that his father had found nearby on the edge of the river whilst working in a garden some 30 years earlier. The local man some 30 years earlier saw a sparkle that caught his eye, as he bent over to pick up the illuminating object the man wondered what it might be. Was it a new mineral discovery for PNG, was it a trekkers possession or simply just a piece of rubbish. What John was about to grasp in his hand would bring a family in South Australia together for the first time. John stood there and held up to the light a dog tag belonging to Private Ronald Goodwin SX13172 from Glenelg, South Australia. Ronald was a part of the Australian Army 2/6 Battalion AIF. The dog tag, it was decided then and there that it should be repatriated to Australia and given to the Goodwin family. 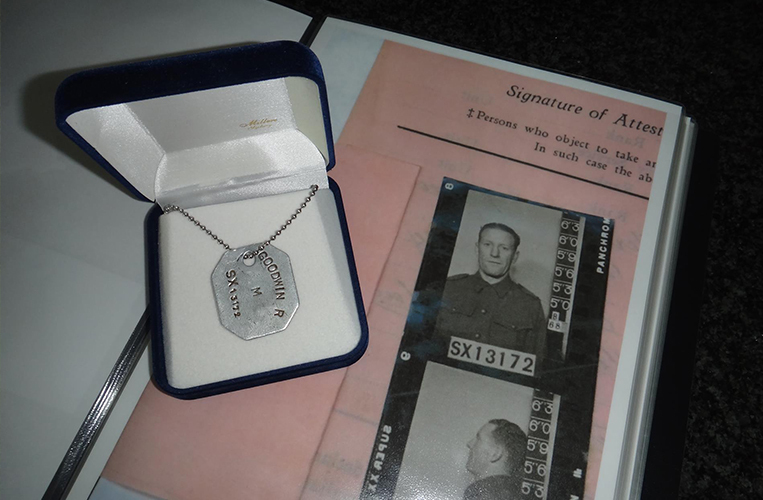 After much negotiation and discussion with the local, the dog tag was again on the move across the Black Cat and Bulldog tracks, some 70 years later, this time heading back home to Australia. John had advised the Australian office of the find and awaited their reply of Ronald’s fait. Sitting around the camp that night they speculated whether or not the wearer of the dog tag survived the war, or did he as many others pay the ultimate price, by the shear fact that they held his dog tag was a fairly grim indicator that it would be the latter. The next day they received word via satellite phone that Ronald had survived the war and returned to Australia. John is an ex serving Australian Army soldier who posesses skills and abilities to not only survive but excel in the jungles of PNG. Back home in Australia John is the Group Manager of Assets & Infrastructure for the NSW Rural fire service. John spent the next 6 months searching for information on Ronald and his family, calling many numbers, which hit a dead end with each dial tone. Brigadier State President of the South Australian RSL. Tim conducted his own searches and found that the 2/6 Battalion operated in the vicinity of Salamaua in WWII so this explains how John came across the dog tag. After investigating the RSL records finding that Ronald Goodwin joined the Glenelg Sub-branch on 22 Mar 1946 and, apart from a break between 1949 and 1951, he was a member of the RSL until his death in 1985. Ronald must have been a pretty capable sportsman as he was appointed captain of the Glenelg Football Club in 1938 and ultimately a life member. Tim has been able to determine that Ronald was survived by his wife, Lorna and he was the father of Trudy, Susan and John. Of these children, Trudy and Susan remain alive and Susan resides in the Adelaide suburb of Athelstone. During the investigations Tim asked Lieutenant Colonel Graham Goodwin an associate within the RSL S.A if he was related to Ronald, Graham gave Tim a blank look and commented that he never knew of a war hero by the name of Ronald Goodwin in his family. Graham made his own investigations and found out Ronald was in fact his Uncle, a war hero, an unknown war hero to him and his family. So the time came, Susan packed her treasured family photos of Ronald in to her car. Making her way to Torrens Parade ground it stirred so many long forgotten emotions to be reunited to not only her father’s lost history, but also her long lost cousin and who was within arm’s grasp for so many years without the faintest knowledge of each other. Susan waited at the old barracks with excitement and anticipation like a child does on the eve of Christmas. Ronald’s dog tag made it’s way across Torrens parade ground to just outside the barracks, where John halted a while to reflect on the journey that not only he has taken, but this dog tag and the stories it will forever hold of where of has been for the last seventy plus years. Finally the moment come and Ronald’s tag was reunited with his daughter and nephew some 28-year’s after his passing. Tears overwhelmed Susan and John stood by trying to compose himself only to be overcome with emotion of trekking some 100 odd kilometers in the dense jungles of PNG and to fly a 1000 plus kilometers to return this tag home to it’s rightful owner.